All transactions are safe and secure with a reliable history in online purchasing behind each of our associates. 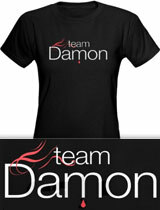 Buy the Team Damon t-shirt to own Vampire Diaries clothing and merchandise. You must be the girl who loves the bad guys, right? If that's the case then you have come to the right place. This Team Damon t-shirt celebrates Stefan's evil vampire brother. Damon has decided that the lifestyle suits him just fine. In fact, he loves it. Unlike his brother, Damon is not willing to give up hunting humans or the powers that go along with it. With a grudge against his brother haunting the relationship, the two try to find their places in Elena's life. If this bad boy gets your blood flowing, snag this Vampire Diaries t-shirt or a Damon Salvatore poster today. In addition to the Team Damon tee above, browse the Vampire Diaries Clothing Gallery for more apparel like men's and women's clothes, kids shirts or hoodies.